I've been wanting to cook something with orzo pasta for a while. Well, ever since I picked up a bag of it at our local food co-op... We always buy a few packs of chicken breasts when they're on sale and put them in the freezer. We also had some spinach and tomatoes left over. So, that about sums up how this dish came together, on with the details! 1. Start by pounding out the chicken breasts to about 1/2 inch thick and season with salt and generous amounts of cracked black pepper. Generous, I said! 2. 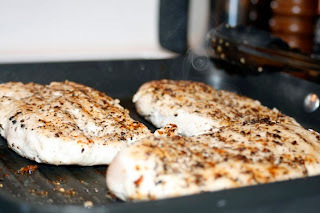 Sear the chicken in a skillet or griddle for about 5 minutes on both sides, then finish for about 20-30 minutes in a 350F oven. 3. Meanwhile, bring a pot of salted water to a boil, then add the orzo. Boil for approximately 5-7 minutes. 4. 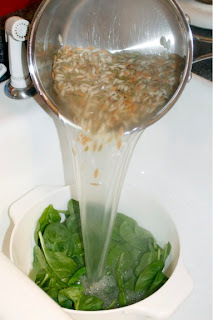 Fill your colander with the fresh spinach leaves, the pour the orzo and water over them. This will quickly cook the spinach leaves so they shrivel up. Let drain. 5. Place the diced tomatoes in the bottom of a medium bowl and stir in about 1 Tbsp of olive oil, along with a bit of salt and cracked pepper. 6. 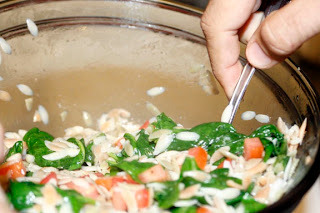 Stir in the spinach and orzo. The pasta should be lightly seasoned to contrast the more heavily seasoned chicken breast. 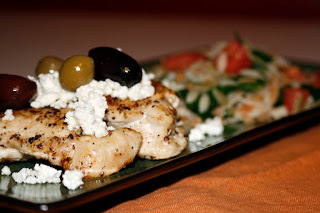 Serve with some feta and olives on top of the chicken breast. 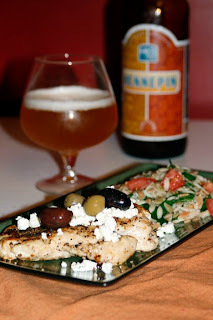 Recommended Beer Pairing: With this dish, I would recommend Saison -- a Belgian-style farmhouse ale. The one we had in particular was Ommegang Hennepin, made in Cooperstown, New York. Lively carbonation, along with a complex spiciness from the yeast, pairs well with many dishes. Come make this for me. You know where I live.